There is a movement afoot in North America to bring awareness to some of our less animal-friendly farming practices. Take poultry, for instance. For a long time, modern farming methods saw hens locked in little cages and stuffed full of antibiotics. This long-standing, completely cruel, and unhealthy practice has been the norm within the meat industry for a while now. But thanks to hard work by activists (like The Humane Society of the United States and Ryan Gosling), things could be a changing. Over the years, more and more companies have been moving towards a process that is far more humane before chicken and eggs (whatever comes first) land on our plates. Currently, Whole Foods is the only grocery chain that is 100-percent cage-free. But back in September, McDonalds announced that they were working towards a cage-free policy and even Target has also joined in on the moral fun. Why is this important? Let me hit you with some truth. In regards to eggs, some scientists and nutritionists believe that free-range eggs have shown higher levels of nutritional value than their battery-produced counterparts. The same can be said for chicken meat. Additionally, caged chickens are fed the waste products of the grain industry and so the yolks contain very little lutein and zeaxanthin, two important antioxidants for the overall health of your eyes. 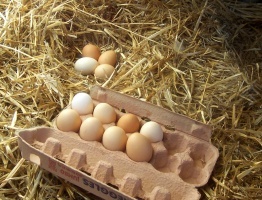 A true free range egg will have a deep yellow and orange yolk, while caged eggs will have watery yellow yolks. Besides all of the nutritional benefits, you also have to consider the overall treatment of the animals. Did you know that when chickens are bred in huge production facilities, the male babies are of no use and are disposed of like trash? Female chicks are kept in extremely dark and cramped conditions (67 to 86 square-inches per bird), while being fed a steady diet of hormones, pesticides, and antibiotics. With 90-percent of eggs still coming from caged hens, it will take time for companies to do a complete switch over. But, as the movement continues, more and more farmers will see the economic benefits a more humane business model. Unless, of course, Walmart and Costco are just pulling the feathers over our eyes, pouncing on buzzwords to drum up positive press. But we’ll give them the benefit of the doubt for now. 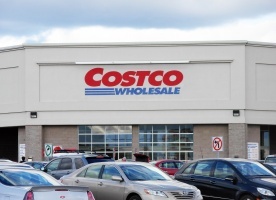 With the year 2025 being Walmart’s goal, which also jives with the timeline of other big grocers including Albertsons, Kroger, and Supervalu, could Costco do better? Or will it be a longer process for the wholesaler? The best laid plans of chickens and men often go awry. Costco was already starting to push towards free range chickens back in 2006 when 2-percent of the eggs sold were cage-free. Currently they are sitting at 26-percent and, by the end of this calendar year (2016), the chain is committed to selling over a billion cage-free eggs. It’s a start, and although they are dreaming big by wanting to build their own facility, keep in mind there are still a lot of logistics that need to be figured out before putting a time frame on their 100% cage-free/antibiotic-free plans. 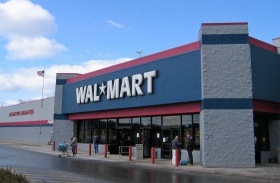 Walmart began offering customers cage-free eggs in its US stores back in 2001. As mentioned, they are looking to be 100-percent free-range by 2025, but of course they say that hinges upon available supply, affordability, and customer demand. Are we dreaming if we think the superstore will actually pull it off? I don’t expect this little article of mine to tip the balance. But, as they say, be the change you want to see in the world! So in an effort to convince you (yes, you) to go free-range, I’ll end with some tasty recipes that require happy hens. Lightly grease a muffin pan with coconut or olive oil; set aside. Add all the ingredients except chicken and hard boiled eggs to the bowl of your food processor and process until it reaches the consistency of a thick paste (about one minute). Add the chicken and process on pulse until the meat is finely ground and all the ingredients are completely incorporated. Divide into eight equal portions. Lay a piece of plastic film onto your work surface and place one portion of meat right in the center. Flatten the meat into a roughly half-inch-thick circle, then place an egg in the middle. Gently slide your hand under the plastic wrap and lift the whole thing up. Use the plastic film to shape the meat around the egg until the egg is completely wrapped, then finish “shaping” it with your bare hands. Place the finished egg in the muffin pan and repeat process with the remaining eggs and meat. Place the Scotch eggs in the oven and set the timer for 25 minutes. After 25 minutes, take the pan out of the oven and carefully tilt it over the sink to drain the liquid that has accumulated in the cups. Place the pan back in the oven and continue cooking the eggs for an additional five minutes, or until golden. Remove eggs from pan and set to “dry out” on a cooling rack for about five minutes. Serve warm or cold, with a side of greens. In a skillet over medium high heat, cook bacon until crisp. Crumble, set aside. Melt butter in an omelette pan over medium heat and saute vegetables, about 2 minutes. Beat eggs; season with salt and pepper and pour into the pan, covering the vegetables. Place a lid over the pan. In a small bowl, combine bacon, chicken, and ranch dressing. Stir well to coat. Once the omelette has set and puffed slightly, carefully flip. Spread the chicken and bacon mixture over the omelette, sprinkle cheese on top, followed by the chopped tomato. Turn off heat and cover with a lid, allowing the cheese to melt. Lift the lid, fold omelette in half, cut into two wedges and serve. Combine the chicken, celery, carrot, red onion, mayonnaise, mustard, celery salt, granulated garlic, paprika, and one teaspoon of pepper in a bowl. Mix until combined. Serve the chicken salad on the toasted rolls with lettuce and tomato. Combine two tablespoons of Parmesan, breadcrumbs, parsley, basil, and 1/8 teaspoon salt in a shallow dish. Place egg white in a separate shallow dish. Dip each chicken tender in egg white; dredge in the breadcrumb mixture. Melt butter in a large nonstick skillet over medium-high heat. Add chicken; cook for three minutes on each side or until done. Set aside. Combine 1/8 teaspoon salt, pasta sauce, vinegar, and pepper in a microwave-safe bowl. Cover with plastic wrap; vent. Microwave sauce mixture on high for two minutes or until thoroughly heated. Pour the sauce over chicken in pan. Sprinkle evenly with the remaining Parmesan and provolone cheese. Wrap handle of pan with foil, and broil for two minutes or until the cheese melts.